All modern braids are made from the same material: Spectra fibre (also known as Dyneema); braid is ideal for nearly all lure fishing applications, its fine diameter and very low stretch are ideal for most lure fishing techniques. Straight from the box the Power Pro has a type of waxy coating, I do not know what the purpose of this coating is and since it all comes of after a very short time it does not matter anyway. The PowerPro in 50lb test is claimed to have a 0.014" diameter, it comes in a choice of colours, either green or white. The green soon turns into a greyish shade and the white gets dirty and appears buff after a while. Made from 100% Spectra fibres. This braid has become very much the first choice for lure anglers in the UK, despite its high price. When new the TUF XP appears to be a flat braid but after very little use the flatness is gone, in use it seems identical in performance to PowerPro, and looks the same after a little use. The diameter is also the same as PowerPro for the same breaking strains. It is rather cheaper than PowerPro. 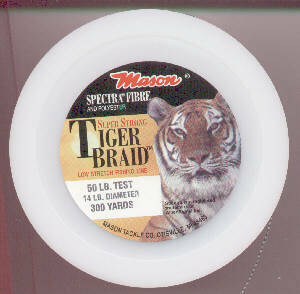 Mason Tiger Braid is noticeably thicker than Power Pro and TUF XP in the same claimed breaking strain, but the packaging is not specific, merely indicating that it is the same diameter as 14lb mono. It has a flecked black and white appearance, presuably caused by the mixture of Spectra and polyester fibres, the white does get dirty after a while. For casting jerkbaits with a multiplier the 50lb test Tiger Braid and 100lb or 80lb test Power Pro are ideal. It is tempting to use lighter lines - after all you certainly don't need 100lb test line to land any pike - but if you do you will soon learn why experienced jerkbaiters use the heavy stuff: the dreaded crack-off! If you try to cast a heavy jerkbait a long way and mistime the cast so you get an over-run on the reel you will see your fine braid snap like cotton and your lure will go flying of - and they go a long way when the line is broken. 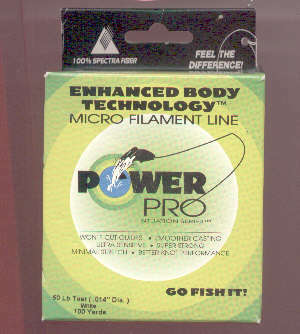 Even lures as light as 45g (1.5oz) will crack 65lb test PowerPro on a bad cast. The actual test rating of all braids seems pretty arbitrary, it is best to compare line by diameter, notice above that the 50lb Tiger Braid is as strong as 100lb PowerPro, it is of similar diameter. It is, unfortunately, not easy to get a true reading of the diameter of braid, some braids are rather flat, so diameter is meaningless. The only way to compare the two braids is in your hand by squeezing them between your finger and thumb and feeling the thickness, even the smallest difference is easily felt this way. I wouldn't trust the breaking strains as stated on any braid, but I know what to expect from these in terms of how hard I have to pull to break it, if the thickness of another brand of braid is similar to these I would expect it to have the same strength. I will use 80lb or 100lb test Power Pro on ABU 5501 and 6501 multipliers for casting jerkbaits and big lures, to prevent crack-offs. I use 50lb test Power Pro or TUF XP for trolling larger lures, mostly this is on ABU 5501 multipliers, but I also have a couple of fixed-spool reels loaded with this that occasionally get used for trolling or casting with moderate-sized lures. 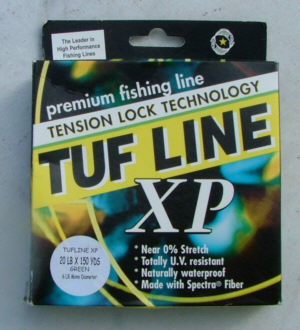 For lighter work I have a couple of low-profile multipliers loaded with 30lb TUF XP, (I don't use ABUs for this, the line lay is not good enough for	the fine diameters, which bed-in badly and cause casting problems), and 20lb TUF on small fixed spool reels for light-medium casting and trolling, and finally 10lb PowerPro especially for zander jigging and trolling or casting for perch (the thinnest TUF XP is 15lb test, and that is too thick for some of the lures I use for this work). The Power Pro and TUF XP are very buoyant, but the polyester in the Tiger Braid soaks up enough water to make it sink, this would be an advantage for some deep water applications except that its thicker diameter completely negates the advantage. Braided Spectra line has transformed lure angling since it first became available in the early 1990s, if you fish with lures it really is the only choice, it is considerably more expensive than mono but its high strength to diameter ratio means that you can recover lures from snags much more often. Remember though to wrap the braid around something like a landing net pole or file handle before pulling on a snagged lure, never pull hard directly on braid from your hand - it will cut through your skin and flesh like cheesewire. In laboratory tests it can be demonstrated that braid has poor abrasion resistance when compared to monofilament, that may be so but in practical use braid lasts a lot longer than monofilament of equivalent diameter (I fish a lot and cannot remember when I last changed the braid on my multipliers, it must be over 5 years ago) and any lack of abrasion resistance is not noticeable. Braid is no more tooth-proof than monofilament line, it will cut insantly on contact with a pike's teeth, always use a wire leader when lure fishing in waters where pike may be present.